E3 is happening in under two weeks, so what better thing to do than to completely destroy the part of the game everyone at E3 will play, and rebuild it from scratch in very limited time? This is of course a very crude mockup of what the new starting area will be. It's smaller than the old one and should work a little better play-wise. We have yet to reshape the terrain around it, so there are huge holes. Our deadline to have this area fully rebuilt is the 6th of June! Current puzzle count is 627. Good luck guys! Hopefully the quickly-crafted starting area should still give the players at E3 a good first impression of the game. I can’t wait to play the game. can you say anything about a release date? How many weeks/months? My buttocks just clenched a little bit. That’s a hell of a deadline. We believe in you. Go for it. Can’t wait to see the reaction at E3. Funnily enough it actually took me a while to realise that this wasn’t the big mountain that’s at the front in most of these Island Snapshots. So I thought that you had removed that mountain and wanted to rebuild it enitrely from scratch. But then I finally noticed that other parts of the island seemed different as well and so I realised that it’s actually a different area. Hah, yeah, sorry. I should have been clear that this is different from the usual angle! Then I figured out that he would never be letting people in there T E3. I do hope that freaking tunnel that seems to have been the starting area since the concept phase does make it back in though. Something totally cool about that. The long slice of geometry leading up to the first two rooms seems to suggest/account for that though. Fantastic — I’m looking forward to seeing it at E3. Will you be showing in the IndieCade booth or somewhere else? I’ll be showing my students’ game in the University pavilion – I made them listen to some of your lectures before they started development, so I’m sure they’d enjoy coming by and meeting you. How does the rest of the team react when a new goal like this is conceived? I imagine it’s exciting / rejuvenating, but must also be a bit nerve-wracking. I don’t know if I’m speaking for the rest of the team, but after three years, these huge changes just became part of the development for me. Obviously I can’t wait to get the game out so people can finally play it, but every time it gets a little better, I get a little happier, so it’s alright. It is also really neat to see an area of the game we’ve been looking at for years and taking for granted go through some major change and become something new and unfamiliar again. 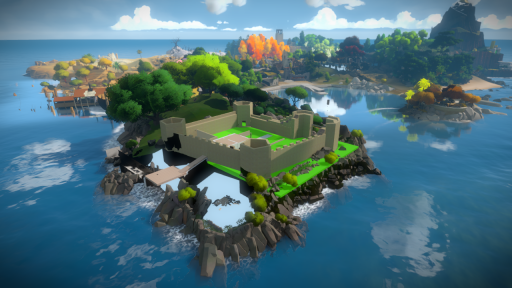 I was really hoping The Witness would be playable at E3. I’m pretty stoked now that I will get to play it. Keep up the great work! I’m sorry but it won’t be publicly playable! We are just showing the game behind closed doors to a small portion of the press. You have absolutely no idea how much I’m waiting to play this game, it just looks so fantastic. If it wasn’t for games like this I would have stopped gaming a long time ago. But why is an E3 demo so important? Just for the press coverage? Also I wanted to ask if there will be some kind of special edition of the witness? I know you are against making cheap money like that, but I am thinking of buying this game for both pc and ps4, to show some extra support for the whole team. If however, there would be some kind of special edition, I would rather spend some more money on that then buying the same game twice. Have you considered this? I’m looking forward to see the demo and I wish you all the best! Interesting that I you are reworking the beginning of the game. I love that you and the team are dedicated to making the game as good as it can realistically be. As much as I want to play this game, I would rather keep waiting and the game keep getting better. The reason being that this is literally the only game I have been greatly anticipating for some time now. Most games are just not that interesting to me anymore, but the idea of something that pushes the envelope like this is extremely appealing to me. Actually as far as my preference goes, I would rather you take an irresponsibly long time to complete this game. Squeeze every ounce of cash and time you can into making it as good as it can be before releasing it. Take so long and make it so good that you know for sure you will not make your money back and you may never be able to make another game again. Go all out and make history. Make it the greatest game ever made and the greatest game to ever be made. That is the game I want to play. I must say I am quite surprised to see such a change to the starting area. However, every other time something has been reworked it has always come out much better. So, I have no doubt that this will be the same. A single week is a very short time to rebuild a nearly complete area though, so I wish the team best of luck. I am curious as to what you found lacking in the previous version, or is it simply a case of compressing the area to remove excess space? I had seen you play through this section in videos and it didn’t jump out in any particular negative way. I’ll admit that I was more caught up in being bummed that people commented on the video about the introductory puzzles being “boring” or “unnecessary,” and kinda missing the point of completeness. That somehow every puzzle panel has to be a real stumper or something. Ah well. The thought of somehow inadvertently perishing before this game is released is at the forefront of my mind when I look at these exciting posts. To not get to enjoy this game would be understatedly heartbreaking. Seriously, good luck at E3 guys. I feel like this game has been a part of my life for the past 4 years, and all I have done is salivate over it. I don’t really know what that says about me or about fan-dome in general but… this game has affected me, before even I have tried it. I’m not usually one to geek out or get starstruck, but there is something hugely special going on here – something to take notice of. I feel like we might be getting close to an announcement here friends. Cue fingers crossing and whatever other generalized superstitions we may use to our advantages. So then Thekla folks, are you detecting any traces of a building excitement? Or is it just me? Wow. You guys are going to finish that up in a week? Well, I can’t imagine you’d decide to do that if you didn’t think it was doable, so I have faith. Given the rich development history you and your team have recorded on this site and others, I would love to one day see a discussion with you and the team about the different design issues you were facing that have inspired the various changes we’ve seen over the years. Just flicking through the different island overview shots shows a ton of variation as ideas have changed and matured. Anyway, wishlist item. I see there’s an island in the bay now (or has that been there?). Also, no more windmill? At least someone gets to play it. :( Lucky bastards!